Today we celebrate the 100th anniversary of Thomas Merton’s birth. Many years ago, when I first returned to church, I – like many others – read his landmark work, The Seven Storey Mountain. This book moved me in many ways, including to being the catalyst to get me out of my “God’s-only-up-there” piety and into a faith where my feet were firmly planted on the ground. There are many gifts that God has given to me through Merton and his work, but today, I am grateful that it was the beginnings of a more integrated life of faith that the book shaped in me. And trust me, that seed was planted in 1990, but has taken many years to start to sprout, and even more years to bloom. And with feet on the ground, those seeds are still sprouting, still blooming. Thomas Merton, pray for us! 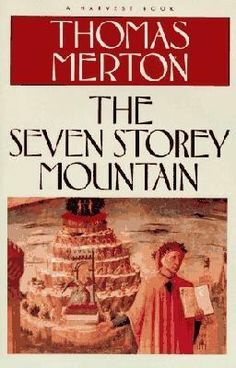 This entry was posted in my life, Thomas Merton and tagged Faith, my life, The Seven Storey Mountain, Thomas Merton by Fran Rossi Szpylczyn. Bookmark the permalink. With our woman’s group reading My Life with the Saints by Fr. James Martin, I was introduced to Thomas Merton. Reading about him elsewhere has lead me to order The Seven Storey Mountain. I can hardly wait for it to arrive.